“I remember driving past as a little girl and thinking, what a beautiful house,” Erin Bennett-Wade reminisced, speaking of her new home. She and her husband Jason Wade bought the house in conjunction with the protection of the surrounding land, a joint agreement between her family and previous landowner Barbara Ellis. Erin grew up right in the neighborhood. Her parents, Steve and Judy Bennett, own land just over the hill, and her brother is close by as well. She’s been living a short drive away with Jason and their two children, but has thought about this particular place for a long time, and even mentioned the beginnings of a wish to Barbara Ellis a couple years ago. Yet it took the completion of another project to inspire this one to action. 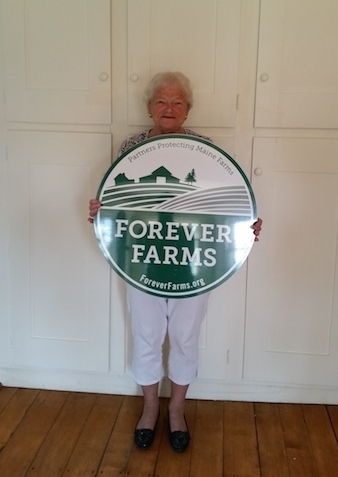 Last year, Maine Farmland Trust protected Erin’s parent’s land, Bennett Farm. Much of the impetus for that easement was Steve and Judy’s desire to safeguard their land for future generations—including Erin and her children—so they could remain in the area. Barbara Ellis accepted the profound importance of that aspiration. Seeing what Steve and Judy did with their land, she knew she wanted to protect her property as well. She and Erin connected over the concept of an easement—for Erin, “It’s always been a goal of mine for generations of the future not to have to worry, and to have the property be taken care of for its traditional use—it’s agrarian land and should stay that way,” and Barbara realized that Erin would be the ideal steward. One year ago, Barbara approached Erin with the proposal, and on the 12th of August, 2015, 150 acres were put under easement and the house sold to Erin and Jason. The transition restores the historical connection between older Bennett house and this property. Steve and Judy’s house is the only one left from the old Beaver Hill Plantation, and Barbara Ellis’s house used to be a stagecoach inn, built 30 years later by the son of the plantation owner. Now, the properties are joined together in a family ownership once again. Managed by four neighboring families, much of the Wade’s current land is set up for maple sugaring, with over 900 taps. Most of the trees are hooked up to lines (spanning over 7 miles) that feed directly into the sugar shack, but they’ve kept a few trees to tap the traditional way as a demonstration area, a kind of “heritage orchard.” Erin’s father is a retired history teacher, and it shows—the plantation is a blend of historical heritage and modern technology, constantly adapting to keep up with the current industry but managing to hold on to its roots. The additional land completes the second half of the sugarbush and creates significantly more potential for their enterprise, titled Beaver Hill Plantation from the historical nomenclature of the area. Moving forward will take some reevaluation to decide how much they want to expand, since sugaring has been more of a hobby than a full-time profession for any of them. They’d like to increase the sugaring operation, maybe create a year-round seasonal farm with pumpkins, hayrides, and possibly even a corn maze. They also have a firewood operation, and manage the land and woodlot carefully to ensure its long-term viability. Erin and Jason’s children, Julia and Brennan, are excited to be the 3rd generation on the land and to be closer to where they process the sugar. They help out with sugaring every year, making forts in the woods for maple syrup Sunday and leading tours through the sugarbush. Julia is making plans to ride her new horse over to grandpa’s place up on the hill, and they’re both thrilled about the huge old barn on the new property. For Erin, having the new protected land and house is icing on the cake for her dreams of ensuring an agrarian future for the area and her children. “It’s really a life milestone for me to have the house, and the easement.” She feels happily overwhelmed by the great responsibility of the property, saying she’s not used to the role of stewardship, but she’s excited to take on that charge. For the three generations of Bennetts and for Barbara Ellis, preserving the past became a way to safeguard the future.